This program is available for Windows 7 / Windows 8. Start up the PC in the Administrator account when downloading and installing. This update program is valid to the supported version. Please read the following text well. Use of this software requires agreement of the Software Licensing Agreement. Installation may only begin after agreement is given. Create a folder on the hard disk to store the downloaded files. Download the following files into the folder created in Step 1. After the files are downloaded, select the files in Explorer and verify the sizes of the files by selecting Explorer's [Organize] menu and then [Property]. If the sizes are as shown below, then the files have been downloaded successfully. If the sizes are not as shown below, delete the downloaded files and then download the files again. Double-click VideoCamSuiteUpdate(2.0L044).bat, downloaded in STEP 2 above. VideoCamSuiteUpdate(2.0L044).exe : 107MB (112,642,440 byte) is created. If you double-click VideoCamSuiteUpdate(2.0L044).bat, you may see a "security warning message". Please click [Execute] and proceed with the operation. Login the computer using the administrative account. Terminate all active software. 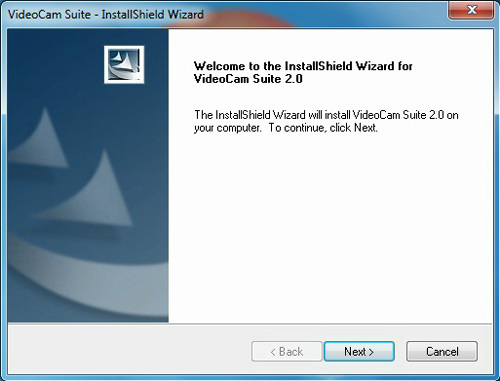 If VideoCamSuite2.0 has already been installed in your PC, uninstall it and then reboot your PC. Insert the CD-ROM supplied with the SD/HDD camera into the DVD/CD drive. If the installer starts automatically, stop the installer by clicking the Cancel button. Double-click Setup.exe (installation support tool) you downloaded first. The update program will start. After the update program dialog appears, click the Next button in accordance with the instructions to start the update procedures. Proceed in accordance with the instructions of the installer. When the following screen appears, select "No, I will restart my computer later." Click the [Finish] button to restart your PC. 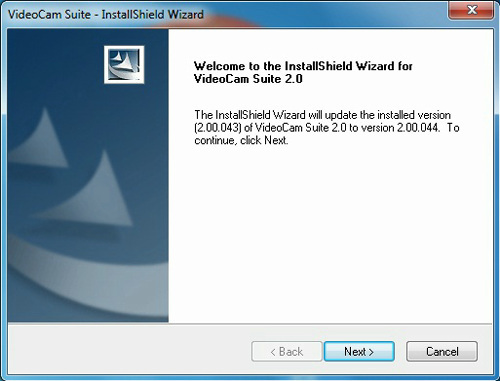 Double-click the VideoCamSuiteUpdate(2.0L044).exe file for updating the VideoCam Suite to run. If message "A program needs your permission continue" appears, click continue Installation starts. 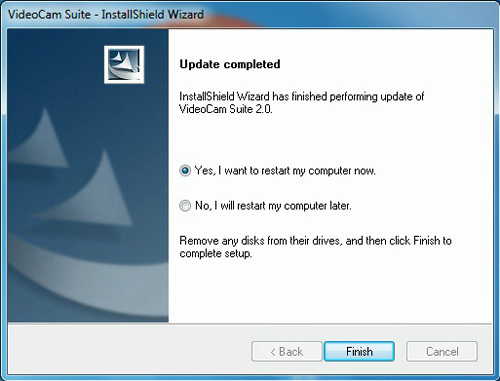 The updater dialog is displayed. Click the "Next" button in accordance with the instructions in the dialog to start updating. When the following screen appears, the VideoCam Suite update installation program has ended. When the PC is restarted, the update has been completed.